This historic building, painstakingly restored in 2002, is part of the St Mary’s Priory Church complex. It houses our food hall, shop, education centre and exhibition. The barn itself has a long and fascinating history. It dates back to the 12th century, when it was built to house the tithes (taxes) paid by the local community to the monks of St Mary’s Priory. After St Mary’s Priory was dissolved in 1542, the Priory site was sold and many of the buildings converted to private use. The Tithe Barn became a coach house before becoming a theatre for travelling actors in around 1645. The illustrious performers to have graced its stage include Sarah Siddons, the fated 18th Century actress. When the theatre closed in 1820 it was used for less glamorous purposes, including a timber warehouse, a grain store, a Women’s Institute shop, a carpet warehouse and an auction house. 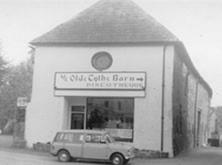 In the 1960sit was bought by a local businessman who converted it into Abergavenny’s first discotheque! Explore our interactive 3D computer model of the Priory complex, and find out how it has changed from Roman times right up to the present day. Discover 1,000 years of Abergavenny’s history, from the founding of St Mary’s Priory by a Norman nobleman in 1087, through the turbulent years of the Reformation and Civil War, to its emergence as a prosperous market town and centre for Welsh culture in the 19th Century. Hear some of the tales of some of Abergavenny’s more colourful characters – find out about the infamous Ogre of Abergavenny and his dastardly deeds, hear about some of the scandalous goings-on at St Mary’s Priory, and discover the engrossing Civil War diary of Royalist soldier Richard Symonds. Marvel at the magnificent Abergavenny Tapestry, hand-stitched by Abergavenny residents to celebrate the history of the town and to commemorate the Millennium in 2000. After your visit, why not refresh yourself with a visit to our Food Hall, where you can enjoy a true taste of Wales. Or browse our shop, which stocks a wide range of quality gifts, souvenirs and local history publications – including Sugar Loaf Soaps, Wentworth Jigsaws of the Abergavenny Tapestry and Holy Socks!